Fused glass plate - 12 inches by 12 inches. 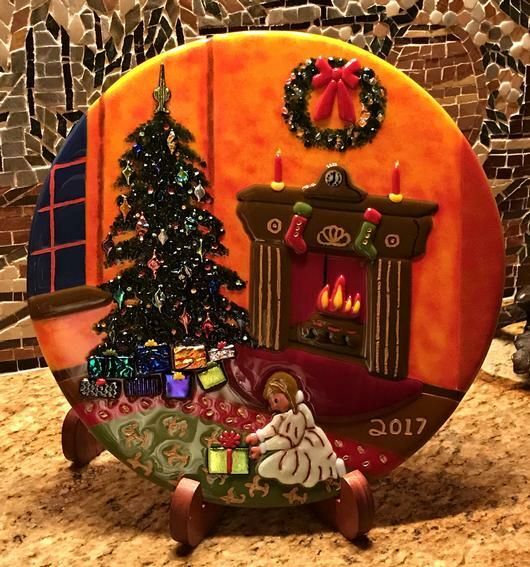 One of an annual series of Christmas Plates using Bullseye COE 90 soft glass. Material forms used include sheet glass, glass enamal powders, liquid glass enamel, and various diachroics. Christmas tree was created using metalic green frit mixed with diachroic frit, with orniments formed from various diachroics. Lights on tree were created by grinding small depressions into the glass using a diamond grinding tool, and then fillling depressions with liquid glass enamel. The same technique was used to create much of the detail in the girl's dress, face, and rug pattern. Note that by using this technique, one is able to hold a trementous amount of detail. Check out the clock on the fireplace mantle - it actually tells time! The varigated wall coloring was created by sifting multiple layers of powdered glass enamels in a random pattern.